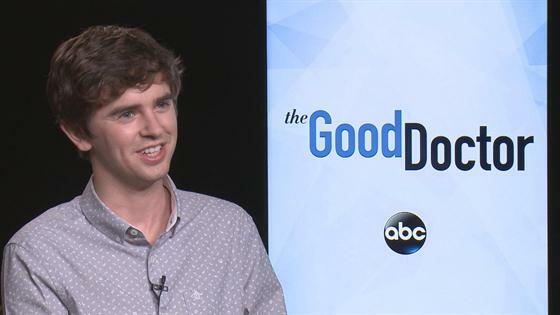 Freddie Highmore's Draw to "The Good Doctor"
People will not stop asking me about The Good Doctor. Each year when I travel home for Thanksgiving, people always ask me about TV shows. I get it, it's my job. And each holiday season, there's always one new show that seems to dominate the conversation. Past seasons have included conversations about This Is Us, Revenge and New Girl in between bites of stuffing and pumpkin pie. Now, it's The Good Doctor's turn. Yes, ABC's medical drama (based on the South Korean show of the same name) starring Freddie Highmore as a doctor with autism and savant syndrome. While some of the other networks leaned into grittier fare (so many military drama, so little DVR space), ABC's decision to air a feel-good medical show at 10 p.m. turned out to be a stroke of genius, with The Good Doctor actually outperforming its lead-in, Dancing With the Stars. Oh, and every other network TV drama, even This Is Us and NCIS. And now, the drama has been nominated for four awards in the 2018 People's Choice Awards, including Show of 2018 and TV Drama of 2018, with Highmore landing nods in the Male TV Star and Drama TV Star categories. But The Good Doctor's success came even before its record-breaking debut last September. Of all ABC's drama pilots, The Good Doctor tested the highest with focus groups and received a great response in the network's internal screening, making it one of their top priorities heading into the fall season. While expectations were high, given the response is received in early screenings, The Good Doctor still "exceeded every expectation," according to Morewitz. Its series premiere garnered the network's most-watched Monday debut in 21 years, bringing in 11.22 million viewers and a 2.2 rating in the adults 18-49 demo. And when you factor in DVR playback, the series premiere's grand total is 19.2 million viewers, with the show setting a record for DVR viewers (7.9 million). "We were hoping to get a number that would allow us to keep this show on the air for a long time, but it's become increasingly difficult to launch shows at 10 o'clock," Morewitz said of the show's success. "When we saw the initial numbers and realized we had built on the Dancing audience, we were thrilled. It's incredibly rare for a show to do better with its second airing than it did with its premiere, but that's exactly what happened with The Good Doctor." So what is it about The Good Doctor that's made it such a breakout success, especially in a time where there is more content and more distractions than ever? First, having a seasoned and successful showrunner in David Shore, who created House, another smash hit medical drama with an unlikely-but compelling lead, helped. But ultimately, The Good Doctor provided what most viewers are looking for these days: an escape. "The takeaway I hear most often is that people love the fact that we are telling stories about a doctor with autism and savant syndrome and a guy who views the world differently than most people," Morewitz said. "Richard Schiff says in the pilot, 'We can give hope to those people with limitations… that they do have a shot,' and that's a huge takeaway from this show. Just because you are different, doesn't mean you can't follow your dreams. It's a very aspirational idea." And in such a charged climate (in every aspect: culturally, politically, etc. ), a little aspiration goes a long way. Consider it comfort food in TV form. Of course, The Good Doctor is only as good as its good doctor, with audiences and critics alike praising Freddie Highmore's turn as Shaun Murphy. "We simply wouldn't have a show without him," said Morewitz. After tackling the role of a young Norman Bates in A+E's Bates Motel, his transition into playing an autistic doctor was an unexpected yet refreshing move. But it almost didn't happen, as Morewitz revealed the 25-year-old actor turned down the role several times before eventually signing on. "He wasn't sure he wanted to jump right back into TV after Bates Motel. We saw a number of actors audition but it's a tricky role and no one was close to hitting it out of the park," Morewitz explained. "Luckily, Freddie decided to jump into the role. My kids were just watching him in Charlie and the Chocolate Factory and, even back then, he had those eyes that speak volumes without having to utter a word. He is an extraordinary actor and we are so lucky that he has brought Shaun Murphy to life." For Highmore, he called the transition from serial killer to doctor "a nice change," joking to E! News, "I guess I had it coming for me having killed so many people over various years to now have an obligation to save some of them or at least try to!" The actor did admit to feeling "pressure" taking on a character with autism, highlighting Shore's "brilliant" writing and the "fascinating" role as his reasons for eventually signing on. "I think we all felt a great sense of pressure, but perhaps more than pressure...a responsibility to people who do have autism to portray Shaun as authentically as possible." The Good Doctor returns Monday, Sept. 24 at 10 p.m. on ABC.